Ongoing Projects i need feedback for. So i have a couple of projects i want to work on, I have finished the storm trooper helmet, i need to get some ideas of what to build on the interior of the storm trooper helmet, a theme or suggestions would be highly appreciated. 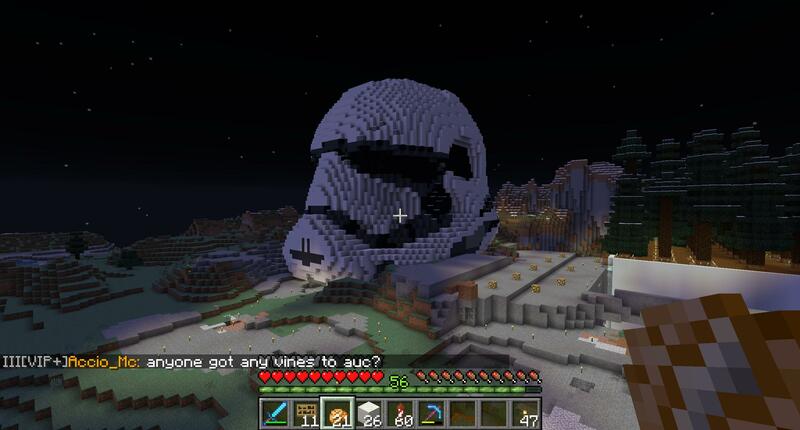 OfLegends suggested building a vader helm nearby which im going to look into, however im wary that the stormtrooper helmet took like 80-100 stacks of quartz and a black build will be so hard to gather resources for until 1.14 wither roses come into game. I have been a massive fan of lotr, star wars, final fantasy for a longtime but ive always thought about building a pokemon as i grew up with the first 3 generations, im about to start building a 3d vulpix however i need alot of materials. im thinking of using orange terracotta for the body and red terracotta for the hair, brown terracotta for paws, i have seen multiple different variations but not sure what colours to go for.